"Right this way Mr. Johnson," Miss Kayla spoke, words flowing between her ruby red lips. She led the way to a back room. Her blonde hair cascaded behind her, down a perfectly tanned neck. My attention however was focused a little lower. A moment later and we were standing in a room universally feared: the dentist's surgery. "Dr. Williamson will be with you in just a few minutes," she informed me before turning about on her heels. "Thank you, Miss Kayla," I called to her back. I made myself at home as much as one can in a dungeon of horrors. The chair was nicer and newer than my last dentist's. I had just started getting used to Dr. Methley when he had to go and die on me. Selfish, right? With little to do but wait, I looked around the room. Nothing particularly out of the norm. The set of freshly sterilized tools sat waiting to either yank my tooth or build a house. There were an assortment of chairs in the room and a even a stool. Why he would need extra chairs in the room, was beyond me, but nothing out of the ordinary. That was when I saw it hanging on the wall. Floating on a sea of white wall hung a picture depicting, what I thought at first, Christ hugging a scraggly-looking saint. Next to Jesus was a copse of trees and a road leading up a hill. There were two other saints there, and a third man, who wasn't clothed. At least that's what it looked like. As I peered closer, I realized it was actually a centaur standing there with the saints. It'd been awhile since I was in Sunday school but I sure didn't remember a centaur ever being in the bible. Certainly not one in any stories of Christ. "Great picture isn't it?" Dr. Williamson said from behind me, completely startling the Bee Gees out of me. "Is that a centaur?" I replied quickly regaining my composure. "Absolutely. It's my favorite picture of a centaur and Christ." "A few. I'm Dr. Williamson by the way. Just in case you're afraid some old guy snuck in here to discuss art with you." He held out a wrinkled hand which I shook, completing the accepted ritual. We shake, then you put your hand in my mouth. I took a quick assessment while I was at it. He was gray up top, skinny, and offered a friendly enough smile. His teeth were a bit yellowed. Wasn't sure how I felt about a dentist with teeth like that. Too late at any rate. He sat down on the stool and pulled up beside me. "I've had a look at your X Ray, and we may end up having to cut the tooth out, which I am equipped to do if necessary," he said into my mouth. "Aght hucksz," I replied around his tools. "Don't worry, you're in good hands. Now, we're going to start with a medium level of sedation. If I need to go any deeper, I'll put you out first so you won't feel anything." "Okay," I said, free of that weird mirror thing. On went the mask, just over the nose so the mouth could still be accessed. A needle containing that crap that makes your face numb for hours also appeared. Whatever it takes so that you don't feel...things. I was reaching that point where I was feeling relaxed but not quite punchy when I made an observation. "Maybe it's Satan," I suggested. He poked at my gums with a tool. "You still feel that?" he asked. "We'll give it another minute than. What about Satan?" "So you recognized him? You're the first in a long time to notice him, let alone see him for who he is." "Oo aih in ah rize?" Dr. Williamson laughed, "no, no prize. It's an interesting thing though. Usually people who see him, see me for what I am." In hindsight, this is the kind of statement that under normal circumstances would freak a person out. There was nothing normal about being doped up as I was. As such, I found his statement hilarious. "Me? No, I'm not the devil. I'm a different beast altogether." He flashed me another smile, this time I noted his incisors had grown out long. Again, fear would have been the normal response. 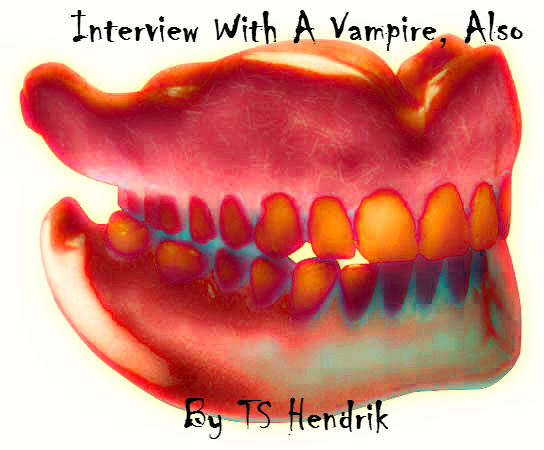 "I've always hated that joke," he said, "but yes, I am a vampire." "Entist ampure. At's a ad djoke. Oo you phloth?" A moment later, I felt a wrench and hammer in my mouth. Nails and chainsaws. Probably just pliers, but that's what it felt like. There was a rocking back and forth in the mouth. It became clear pretty quick from the pain that it was too deep for him to remove that way. "Nope," he said wiping his brow, "it's going to have to be cut out. Ready to go under?" Apparently a rhetorical question as he turned the gas up higher. "Oo you thuck your atients?" I asked. A hand appeared on my shoulder in a comforting way, along with a reassuring smile. "If I drained my patients of blood, I'd have to close my practice." "Aughahahfiu." I think I laughed. "Besides," he added, "it's much easier to replace receptionists." After that it was fade to black. I can't say how long I was under. Or what the fanged one was doing while I slept. When I awoke, my face was still numb, and stuffed full of cotton gauze on one side. I layed there a bit, till I was steady enough to get to my feet. "Look who's returned to the land of the living," said Dr. Williamson. I nodded my head and followed him out to the reception area. "Carol, please schedule him for a follow up next week. I want to make sure he's healing properly. He lost a lot of blood today." I looked at the receptionist. A pretty African American gal sat where Miss Kayla had been not long before. "Carol?" I asked, "what about Kayla?" Dr. Williamson laughed, "Someone's still a little loopy. Carol, can you set that appointment for Mr. Johnson?" A moment later he was gone, ushering another patient in. I shrugged it off. It had to have been a nightmare caused by the gas. "Is Monday at 2:30 alright for you Mr. Johnson?" Carol asked. "Huh? Yeah, that's fine. What do you think of the Doc?" I asked back. "Hard to say," Carol responded, "it's my first day." Oh man! That was really good Tim. Funny, creepy and really good!